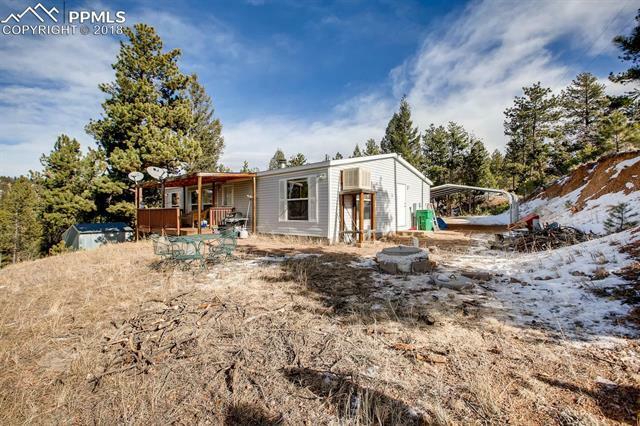 Stunning mountain views from the front of this manufactured home on 2 acres in Florissant Heights. It would make a fantastic vacation getaway or live year around! Tall pines surround the property, workshop, 2 car carport, spacious country kitchen, island, newer appliances, washer & dryer stay, wood burning rock fireplace, evap cooler, newer electric water heater. Watch the sunlight creep across the valley below, the wildlife, peace & quiet here on Bear Mountain. Just 10 min to Florissant, 30 min to Woodland Park.